The typical cost for the Kumon Program ranges from $110 to $140 per subject per month, but most Kumon Centers are individually owned and operated, so that cost may vary slightly by Center. During your Parent Orientation, your Kumon Instructor will discuss tuition and fees. 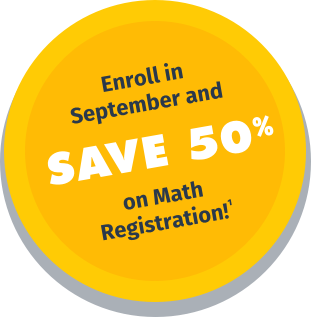 No program or curriculum gives your kids a better foundation in mathematics than Kumon. Parents often choose tutoring in the hopes of quickly eliminating a child’s math struggles. But a short-term fix doesn’t address the fundamental gaps in learning. The Kumon Method ensures children master every building block of math through a proven method of short, daily assignments known as the Kumon Worksheets. The math worksheets take approximately 30 minutes per day, two days a week at the Kumon Center and the other days at home. Each worksheet ensures a concept is mastered, before moving on to the next incrementally more challenging worksheet. While a tutor may start a fifth grader on fifth-grade math, Kumon may start them at a different level. The Kumon Math Program keeps kids advancing and never limits their learning. Many Kumon children who start a bit behind not only catch up but advance to studying material ahead of their grade level. 1 Offer valid at participating Kumon Centers only when you enroll between 9/1/17 and 9/30/17. Most Kumon Centers are independently owned and operated. Additional fees may apply. © 2017 Kumon North America, Inc.